"Help Blue the Bee sing a song"
Bees send messages by moving their bodies. The waggle dance is one way worker bees share news of where others can find pollen and nectar. Help Blue the Bee sing a song on your keyboard. Click the picture below to begin! It is fun and educational, too. Learn about pollinating, growing and harvesting apples in our orchard. 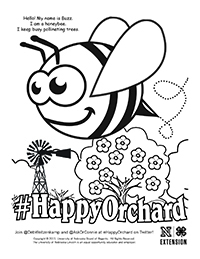 We're excited to introduce our pollinator friends at #HappyOrchard to you! Go to your App store, search for #HappyOrchard and download for FREE! FREE Coloring Pages...Click on each page shown, print, and have some fun! where you may purchase copies.